short life of Thomas Heber Chapin. 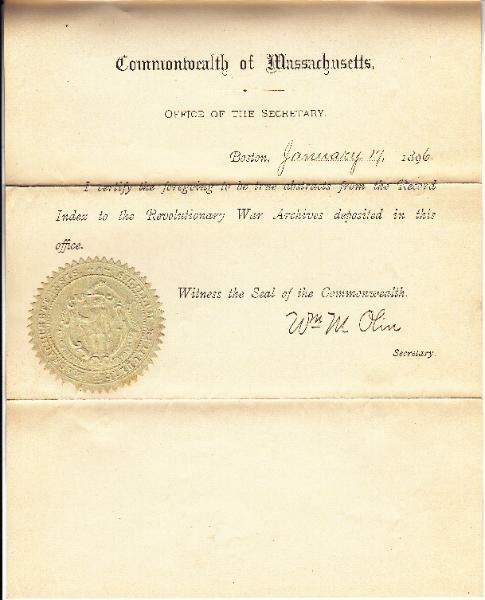 16, 1777 - Service 2 mos. 1 day. Co., Col. Nathan Sparhawk's regt. - Detached by ordr of Council of Sept. 17, 1778 to reinforce Gen.
Sullivan. 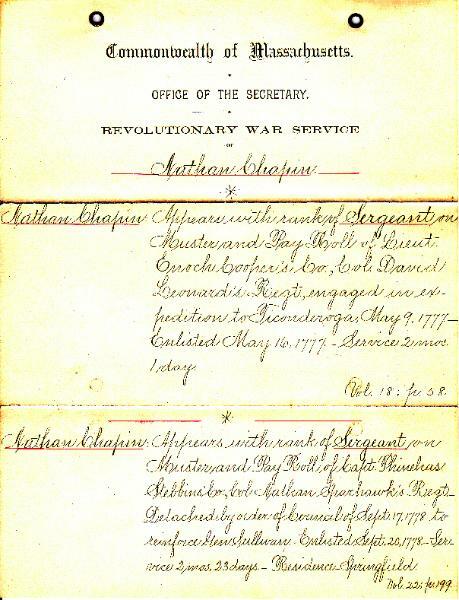 Enlisted Sept. 20, 1778. Service 2 mos. 23 days. Residence- Springfield. Archives deposited in this office. Witness the Seal of the Commonwealth. Anne H. Cresson, Sec'y and Treas. Nathan Chapin, b. Feb. 3. 1735. d. Feb. 13, 1830. 1. Mary Smith of Ashfield = pub. Dec. 15, 1757. Japhet Chapin b. Mch. 16, 1697. d. Feb. 8, 1736. 2. Thankful Dickinson of hatfield = pub. Apl. 22, 1726. Thomas Chapin b. May 10, 1671, d. Aug. 27, 1755. m. 1694. 3. Sarah Wright d. July 26, 1770. Japhet Chapin of Chicopee b. 1642, d. Feb. 20, 1712. 4. Abilemah Cooley m. July 22, 1664. Samuel Chapin, Boston 1641 Springfield 1642, d. Nov. 11, 1675. Cisely d. Feb. 8, 1683. French Maiden and went to Dartmouth England and emigrated to Roxbury. Ancient Widsor, Vol. II, p. 145. 1. Mary Smith not traced. Hepzibah Gibbs (dau. Samuel) d. 1713. Nathaniel Dickinson b. 1644. d. Oct. 11 1710. Hannah d. eb. 3, 1679. Nathaniel Dickinson, Northfield 1637, d. June 16, 1676. Samuel Gibbs m. 15 Apr 1664. Ancient Windsor p. 287 p. 174. Martha Kitcherel dau. of Samuel of Hartford d. Oct. 19, 1708. 4. Abilenah Cooley, not traced. 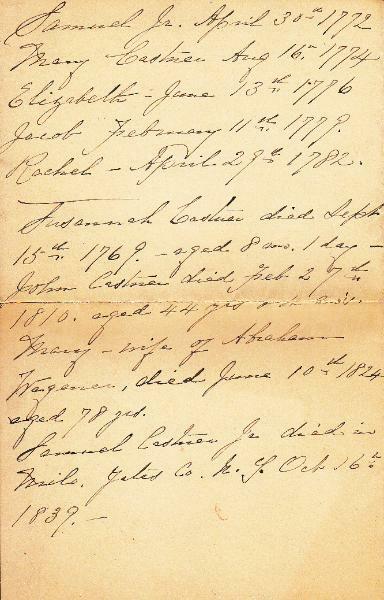 Elizabeth Castner, daughter of Samuel & Mary Castner, was born June 13th 1776. Married Nathan Chapin March 13th 1795 at Gwynedd Montgomery Co. & died Jan 14th 1854. Samuel (1st) born Jan 10th 1796 - died July 11th 1796. Samuel (2nd) born Dec. 12th 1797 - died June 1834. Louisa born Feb. 8th 1800 - died May 27th 1823. William born Oct. 17th 1802 - died Sept. 20th 1888. Maria born M'ch 9th 1805 - died July 9th 1894. Samuel married Emma Ferdier in 1820. Children William & Louisa, both married. William married Elizabeth Hun Rasselt M'ch 26th 1828. John Rasselt born Dec 3d 1829. Married Harriet Elvira Preston. Tomas Heber born Nov. 6th 1831 - died Aug. 5th 1853. Anna Elizabeth born May 24 1836 - Marr'd William Beatty Thompson. Harriet Maria born january 22nd 1838 - Married William Hill. 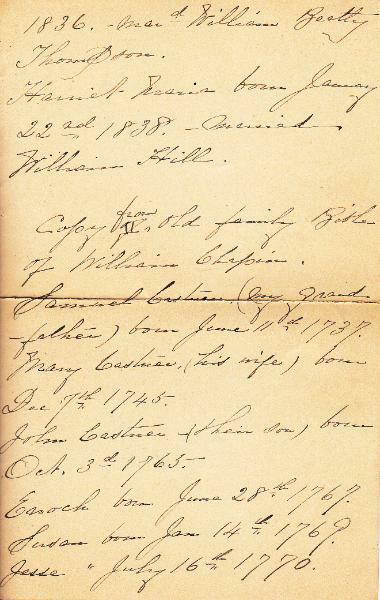 Copy from old family Bible of William Chapin. Samuel Castner (my Grandfather) born June 11th, 1737. Mary Castner (his wife) born Dec. 7th 1745. John Castner (their son) born Oct. 3d 1765. Enoch born Jan. 14th 1767. Susan born Jan. 14th 1769. Jesse [born] July 16th 1770. Samuel Jr. April 30th 1772. John Castner died Feb. 27th 1810 aged 44 yrs & 4 mos. Mary - Wife of Abraham Wagener died June 10th 1824. 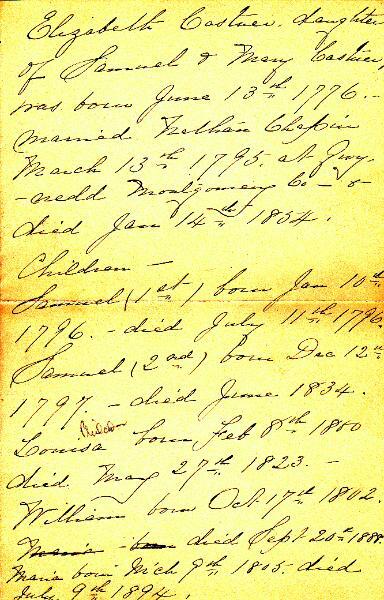 Samuel Castner Jr. died in Milo, Yates Co. N. Y. Oct. 16th 1839. 1601, all of which is certified by A. Sinzee Giles, Vicar of Paignton. Cicely Penny was the daughter of Henry Penny of Paignton. with his family in 1642. Deacon Samuel Chapin died Nov. 11, 1675, age not known. Mrs Cicely Chapin died Feby 8, 1683, age not known. Cooley, died Nov. 17, 1710. 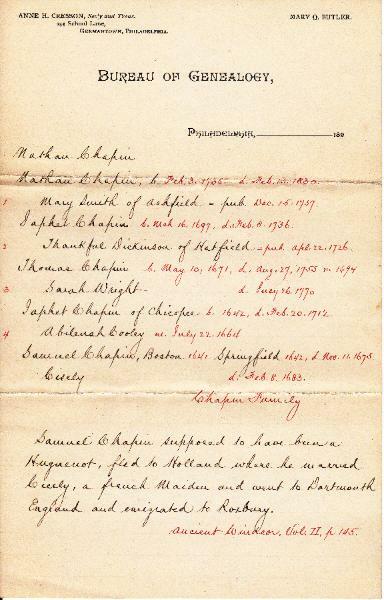 Thomas Chapin, son of Japhet and Abilenah Chapin, b. May 10, 1671, d. Augt 27, 1755, age 85. Married Sarah Wright who died July 26, 1770, age 98. 89. 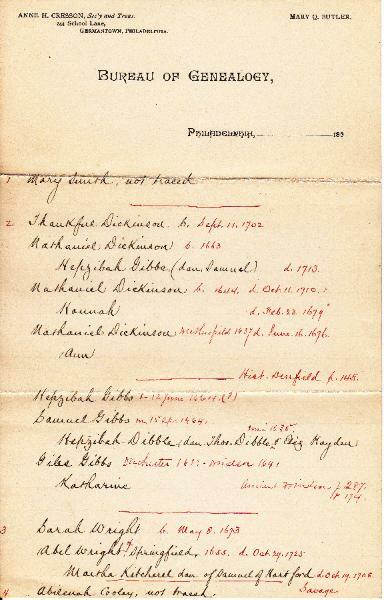 Married Thankful Dickinson, Married 2d Lydia Belding. d. June 19, 1790, age 92. Feby 13, 1830, age 96. Elizabeth Castner of Gwynedd, Montgomery Co., Penna, b. 1776, died Jany 14 1854 age 78. Philadelphia Sept. 20, 1888, age 86. Married Elizabeth Hun Bassett of Bushwick, Long Island, b.
John Bassett Chapin, son of William and Elizabeth Hun Chapin b. Dec. 4, 1829. Married Harriet E.
Preston, Mar. 18, 1858, daughter of Silas Preston and arah Preston (S.P. Soldier War of 1812). 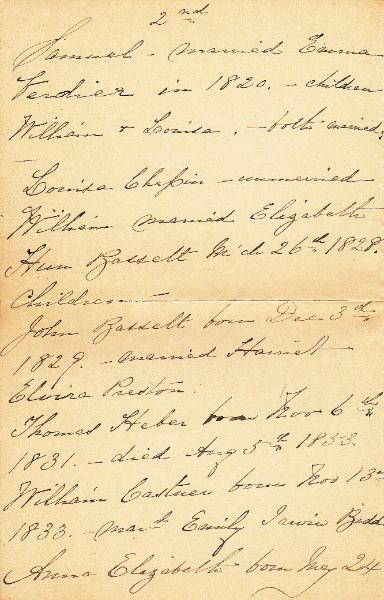 Now living children of John B. Chapin and Harriet (Preston) Chapin. Harriet Elizabeth (Chapin) Bodine b. Mar. 6, 1859. Frances Preston (Chapin) Gilbert b. Oct. 25, 1860. Eleanor (Chapin) Mosher b. Mar. 16, 1862. John D. Chapin, b. Feby 28, 1864. William Morris Gilbert Jr. April 18, 1894. Harriet Elizabeth Gilbert July 9, 1900. Frances Chapin Gilbert March 18, 1902. Harriet Elizabeth Gilbert married Monmouth S. G. Buckbee in Yonkers, N.Y., Oct. 18, 1922. Monmouth Gilbert Buckbee, son of Harriet & Monmouth S. G. Buckbee born Nov. 23, 1923. Monmouth Gilbert Buckbee married Jean Marnion [?] Sept. 18, 1954 in White Plains, N. Y.
Monmouth Sela Buckbee, son of Monmouth & Jean Buckbee, born July 18, 1955. Diana Buckbee, daughter of Monmouth & Jean Buckbee born Aug. 27, 1956.